Easily mount your bird house or bird feeder to a 4 x 4 post with the Achla Post Flange. A 6" diameter platform tops this wrought iron mounting bracket. The feeder or birdhouse can then be mounted by driving screws through the four 1/4" pilot holes in the platform and into the material of your birding apparatus. The sleeve fits securely over a 4 x 4 wooden post, and can be secured through four 5/8" side holes. The welded construction will hold up under a great deal of stress, and the black powder-coated iron will withstand harsh conditions for many seasons. 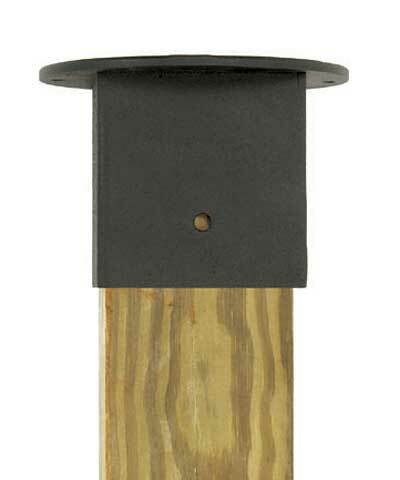 Mount your bird houses or bird feeders onto wooden posts using this Post Flange.